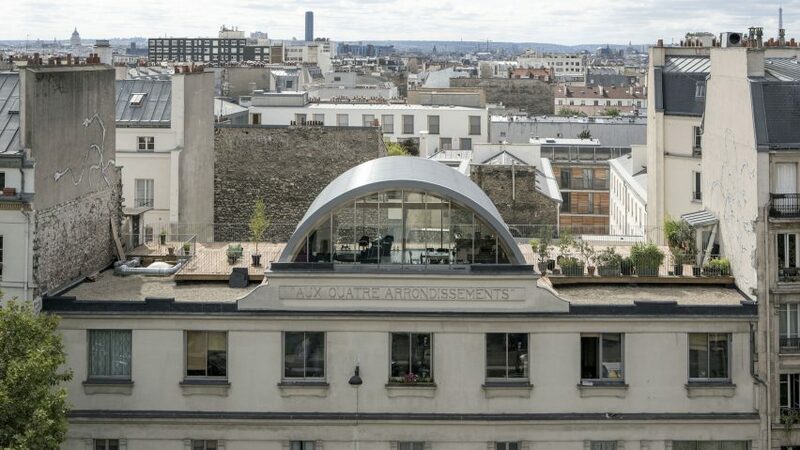 Post Office Architectes has added a timber-lined barrel vaulted roof extension to an apartment in Paris, giving its owner an unobstructed view of the Eiffel Tower. The apartment building is located at the intersection of four Paris districts and was originally built in the 19th century as a two-storey department store. 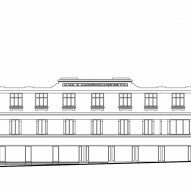 A third floor was added in the early 20th century, along with a pediment bearing the name Aux Quatre Arrondissements. The client, French photographer Matthieu Deluc, wanted to add a roof extension to his top-floor apartment that could be used as a photography studio during the day and a living room in the evenings and weekends. "Building the city on top of itself is a difficult endeavor in historical Paris. The design started in 2012, and despite the relatively small scale, it took about 5 years to complete," Post Office Architectes co-founder Line Fontana told Dezeen. "The client's budget was also very tight, so we had to come up with a simple yet strong architectural proposal, and with very economical construction solutions," added Fontana, who has offices in both Paris and New York. 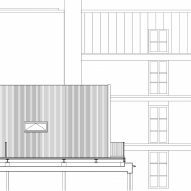 The studio conceived the extension as a single barrel-vaulted volume laid out along the building's axis. The volume, made of pre-assembled wooden arcs, opens at one end to the Boulevard de La Villette, and at the other to the rooftops of Paris with a view of the Eiffel Tower. 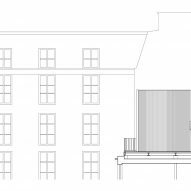 A set of doors on the Boulevard de La Villette end open out onto a terrace with timber decking that extends across the roof and wraps around three sides of the extension. The inside of the vault is clad with insulated wood panels that create a warm and welcoming interior, while the outside is clad with sheets of corrugated lacquered metal that are intended to capture the colours of the Parisian sky. 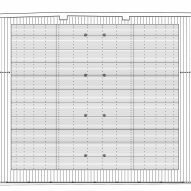 In order to reduce on-site assembly to only 15 days, all parts of the building were prefabricated and assembled in a factory, including the vault structure, the insulated wooden modules, the outer metal cladding and the terrace floor. 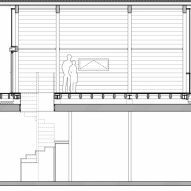 A series of openable sections within the glass facades on either end of the extension allow for natural ventilation, while solar panels installed on the roof produce energy for the new volume. 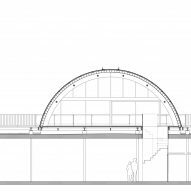 In south-east England, Mole Architects also designed an extension with a barrel-vaulted timber roof that references local agricultural buildings to a protected farmhouse. Photography is by Matthieu Deluc.